The City of Edinburg and the DSWM Commercial Collection Services Program is proud to offer 20 and 30 yard roll-off box service. Roll-Off's are available for a variety of applications, from construction sites to large industrial facilities, hospitals, businesses, residential establishments, clean up projects and schools. Roll-off containers are typically used for the disposal of large and/or heavy debris such as rocks, bricks, concrete, wood or other materials resulting from construction, demolition, remodeling or general cleanup. To assist in selecting a container, recommended sizes are listed below. Rates are based on the size of the container. Our rates are evaluated and set annually based on the cost of our service. Please contact our office so that we can help you find the container that best fits your needs so that we can start service as it is necessary. Our flat rate rental fee allows you to plan ahead with your budget in mind and guarantees no surprise cost increases. Due to the limited number of containers, the size requested may not be in stock. Residents may pick another size or be placed on a waiting list. Keep Dumpster Area Clear Of All Debris, Brush & Bulky Waste. Gates/Enclosures To Dumpsters Should Be Opened Prior To Service. 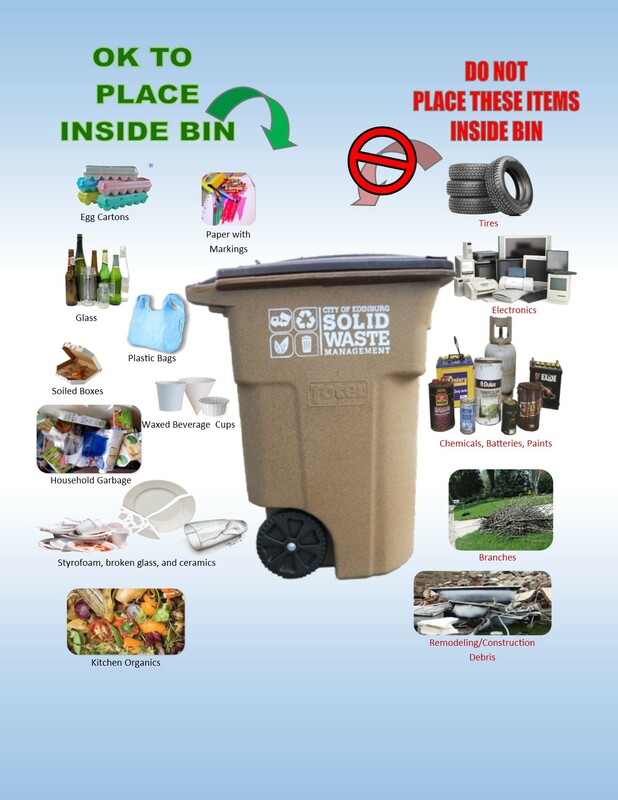 Only regular debris, junk, scrap and/or trash should be placed in any City owned roll off containers. All other household garbage or petrucible (decomposable) waste should be placed in regular city plastic carts or commercial dumpsters, unless special arrangements have been made with the DSWM for Special Collection Services. DSWM encourages the bagging of all your garbage prior to placement in your container to assist in keeping your container clean and sanitary, as well as to help prevent vectors and windblown litter on windy days. Hazardous, Medical Waste liquids or any materials prohibited at the landfill (radioactive, reactive, toxic, ignitable, corrosive, pathological, acidic, etc.) - for disposal options, call SWM at 956-381-5635. Please follow our link for more information on our services or review our approved/unapproved material guide here. Any cardboard boxes or cartons are considered recyclable and residents may utilize the Edinburg Recycling & Educational Center to dispose of these recyclable materials. For more questions regarding recycling programs and services please call 956-292-2133 or visit our Recycling Services section.